Combustion of natural gas emits about half as much carbon dioxide as coal and 30 percent less than oil, and far fewer pollutants, per unit of energy delivered. Natural gas is now the largest source of U.S. electric power generation, helping reduce U.S. greenhouse gas emissions to mid-1990 levels. To fully realize the potential climate benefits of natural gas, technologies and policies must be put in place to minimize methane leaks and capture carbon emissions. Technological advances have greatly increased U.S. natural gas production, keeping prices low and spurring many utilities to switch from coal to natural gas. Because burning natural gas yields fewer carbon dioxide emissions than burning coal (one-half) or petroleum (one third), natural gas use has helped reduce U.S. greenhouse gas emissions to mid-1990s levels. Natural gas is now responsible for about a third of U.S. electricity generation, similar to coal. Replacing certain electric appliances, such as space and water heaters, with natural gas models. Substituting natural gas for diesel and gasoline in fleets and heavy-duty trucks. Using natural gas in more efficient combined heat and power systems in manufacturing. Expanding use of natural gas-powered turbines, fuel cells, microturbines and other forms of distributed generation producing efficient, on-site energy that makes use of waste heat. Minimize leaks of methane, the core component of natural gas, which has a short-term but strong impact as a greenhouse gas.Methane stays in the atmosphere 12-17 years, much less time than carbon dioxide, but has global warming potential 23 times higher than carbon dioxide compared over a hundred-year period. Sensible policy and technology options can help accurately measure and reduce deliberate and accidental releases of methane during production, transmission, and distribution. Capture the emissions of carbon dioxide when natural gas is burned.Carbon capture technologies could significantly reduce emissions at natural gas- and coal-fired power plants. These technologies are already in use in the industrial sector, but are just entering the power sector. NET Power’s Allam Cycle technology, which is being tested at the 50-megawatt-thermal scale near Houston, could generate power from natural gas with near-zero CO2 and nitrogen oxide emissions, while also eliminating the need to use water for cooling. Natural gas is a naturally occurring fossil fuel consisting primarily of methane. It may also contain heavier liquids (also known as natural gas liquids) that can be processed into valuable byproducts including ethane, propane, butane and pentane. Historically, natural gas has been conventionally extracted from large reservoirs and often produced in conjunction with oil. 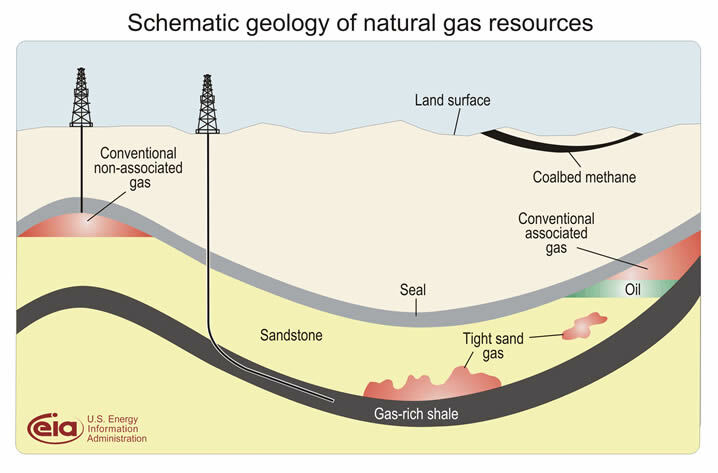 In the 21st century, technological advances in horizontal drilling and hydraulic fracturing have made it easier and cheaper to obtain gas from smaller unconventional sources including non-porous sand (tight sands), coal seams (coal bed methane), and most recently from very fine-grained sedimentary rock called shale (shale gas). Concerns about the practice of hydraulic fracturing include: stress on surface and ground water supplies, contamination of drinking and surface water, handling of discharges from fractured wells, and air pollution. Constituting about a quarter of primary energy consumption, natural gas is important in almost every economic sector, including electric power generation, industry, residential and commercial buildings, and transportation. With the rapid increase in supply, natural gas plays an increasing role in power generation. Natural gas now exceeds coal as the largest power generation fuel source at about one-third of the U.S. market. Natural gas combined cycle (NGCC) power plants can provide baseload, intermediate, and peaking electric power, essentially able to meet all types of electrical demand. It is an inexpensive, reliable, dispatchable source of power that can supply firm backup to intermittent sources such as wind and solar. Natural gas power plants can be constructed relatively quickly, in as little as 20 months. Beyond the benefits of substituting natural gas for coal in a traditional, centralized power-generation system, emissions could also be reduced through distributed generation, making electricity at or near the site where it is used. A common example is solar panels on home or office rooftops, but natural gas-powered combined heat and power (CHP) systems and fuel cells are becoming more common in industrial, commercial, and residential settings. The power sector would see further cuts in carbon emissions by using carbon capture technology at both coal and natural gas plants. 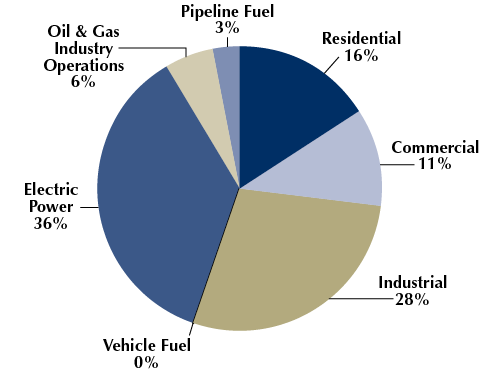 Natural gas provides almost a third of the energy used by U.S. industry. It is used for on-site electricity generation (fueling boilers and turbines); for process heat to melt glass, process food, preheat metals, and dry various products; and for combined heat and power (CHP) systems. Natural gas is also used as a material input itself—as a feedstock—to make products such as fertilizers, chemicals, and plastics in processes that do no emit greenhouse gases. Even as the manufacturing sector expands, replacing lower-efficiency boilers and deploying CHP systems can reduce emission intensity while using more natural gas. Analysis by the Massachusetts Institute of Technology found that replacing older natural gas boilers with high-efficiency or super-high-efficiency units would decrease CO2 emissions by 4,500 to 9,000 tons or more per year per boiler. Electricity use has been growing more rapidly in buildings due to the proliferation of electronic devices, while natural gas use has remained flat and generally confined to space heating, water heating, cooking, and clothes drying. However, natural gas appliances can often be more efficient on a full-fuel-cycle basis than similar appliances that use electricity, propane, or oil. The source-to-site efficiency of natural gas, averages 92 percent; that is, 92 percent of the energy contained in extracted natural gas is useful energy that can directly fuel appliances, as compared to about 30 percent efficiency for electric appliances. Natural gas may also increase the overall efficiency of consumer energy when used for electricity generation on site through fuel cells and microturbines. Natural gas-powered fuel cells use natural gas and air to create electricity and heat through an electrochemical process rather than combustion. Fuel cell technology has been around for decades, but has not been widely deployed due to concerns about cost and durability. Microturbines are small combustion turbines approximately the size of a refrigerator with individual unit outputs of up to 500 kilowatts (kW). They can be fueled by natural gas, hydrogen, propane, or diesel. Like fuel cells, microturbines can achieve much higher energy efficiencies, because the electricity and waste heat generated can be used on site. Transportation accounts for about 27 percent of U.S. greenhouse gas emissions, and energy use in the sector is dominated by oil. Only 3 percent of vehicles on the road in the United States are fueled by natural gas. Of these, the majority are buses and trucks running on compressed natural gas (CNG) or liquefied natural gas (LNG). CNG and LNG can reduce greenhouse gas emissions as compared gasoline and diesel, and they are energy-dense fuels that can be used in heavy-duty engines where electrification may not yet be economically viable. Limited availability of fueling infrastructure is one of the hurdles to deploying more natural gas trucks. This guide addresses questions that private investors and state and local agencies may have about key considerations and strategies for deploying NGVs in public and private fleets.